What type of image do you conjure up in your mind whenever you think about the tropical island, Hawaii? Do you imagine pastoral landscapes where a bright vivid sun beams down over a clear blue sea, while a plethora of dusky looking maidens dance around in grass skirts? Well I don't! Whenever I picture Hawaii I always think of science fiction. No. Don't worry. I haven't run out of my medication (yet). My reasons for saying this are pretty simple. Come September, 2017, the popular beachfront fan convention, HawaiiCon, will be celebrating the 40th anniversary of Star Wars and the 20th anniversary of the Joss WhedonVerse. Already lined up to attend are a number of celebrities from the Star Wars franchise, which include: Paul Blake (A New Hope), Steve Blum (The Old Republic), Mary Elizabeth McGlynn (Rebels), plus Temuera Morrison and Daniel Logan (Attack of the Clones). Over 20 celebrities are expected to be in attendance, and more will be announced soon. 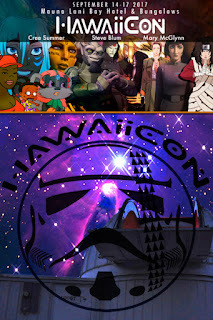 Now for those of you not in the know, HawaiiCon brings together sci-fi fans and leading cast members from everyone's favorite TV shows and films. The event also features well-known cosplayers, space scientists, visionaries, gamers, plus comic book artists and writers. On a side note, HawaiiCon caps its daily attendance at 1500 fans so they can maintain the intimate and special experience between attendees and celebrities. 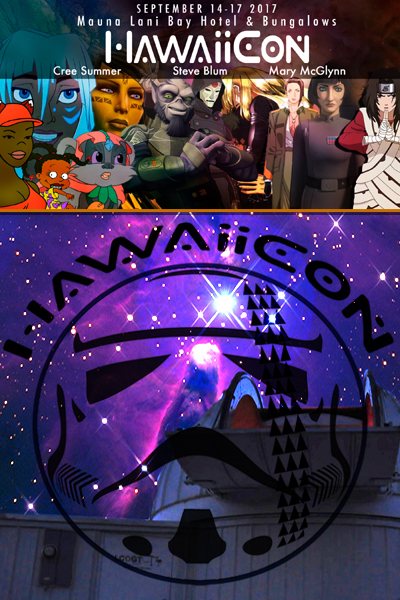 HawaiiCon is a non-profit event that helps children of the Big Island ‘Reach for the Stars’, both in the fields of science and the performing arts. Those of you who attend will be able to see how the money raised is being put to good use, and while you're at it, you'll also be able to: (1) Get up close and personal with the stars; (2) Play or enter a number of gaming competitions; (3) Dress up and be a part of HawaiiCon's annual cosplay contests; (4) Attend workshops, panels, or discussions; plus (5) Let's not forget about the gala dinner held on the beach. Here's a quick infographic from hawaii-guide.com which will show you what else Hawaii has on offer. Where: Hawaii's Mauna Lani Bay Hotel & Bungalows Resort. When: From the 14th of September to the 17th of September, 2017. How much: Prices will be reflected on the website in due course. Now for any more information please go to hawaiicon.com, or follow them on their facebook or twitter pages. Go on, click-click, and say aloha from me.